LANDSLIP has been funded under the UK Natural Environment Research Council (NERC)/Department for International Development (DFID) Science for Humanitarian Emergencies & Resilience (SHEAR) programme. SHEAR aims to support improved disaster resilience and humanitarian response by advancing monitoring, assessment and prediction of natural hazards and risks across sub-Saharan Africa and South Asia, and, through working with users, bringing this into use to reduce the impacts of disasters. About 12.6 per cent of Indian land mass is prone to landslides, with the Himalaya and Western Ghats regions particularly prone due to climate, geomorphology and geology. Rainfall and earthquakes are the main triggers of these landslides. 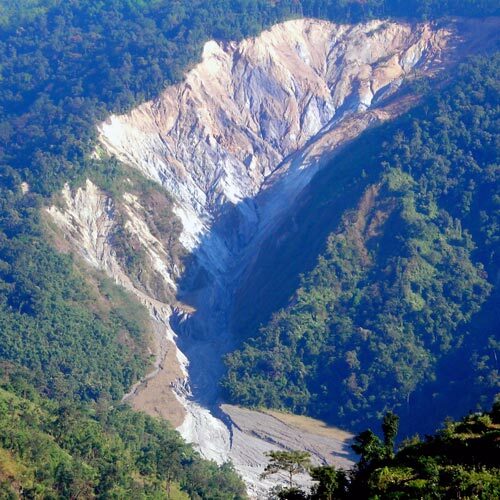 Poor land management practices (e.g., deforestation, slash-and-burn cultivation, haphazard mining and heavy tilling in agriculture) coupled with increased development and poor settlement location have increased the vulnerability of national and district authorities in these areas to landslides. The impact of landslides on people, business, culture and heritage can be considerable and wide ranging, including fatalities, loss of agricultural land and infrastructure, and damage to ecosystems. To build resilience to landslides in these vulnerable national and district authorities (a key aim of SHEAR), a root-and-branch evaluation of human interactions with landslide-prone environments and improved knowledge of the 'physical' processes are required. Developing approaches to integrate weather, landscape and social dynamic models is fundamental to building an effective, hydrologically controlled landslide early-warning system (EWS). Mana Khola landslide, Latpancher, Darjeeling. Through advances in interdisciplinary science and application in practice, the collective ambition of this consortium is to contribute to better landslide risk assessment and early warning in a multi-hazard framework, and, by working with national and district authorities, better preparedness for hydrologically controlled landslides and related hazards on a slope to regional spatial scale, and daily to seasonal temporal scale. Our programme will operate in partnership with decision makers in public and private sectors, academics and not-for-profit agencies to achieve an overarching aim of contributing to better landslide risk assessment and early warning in a multi-hazard framework in India, aiming to increase resilience and reduce loss. LANDSLIP will develop new insights by building on existing scientific research in India, the UK and Italy, using interdisciplinary methodologies and perspectives. 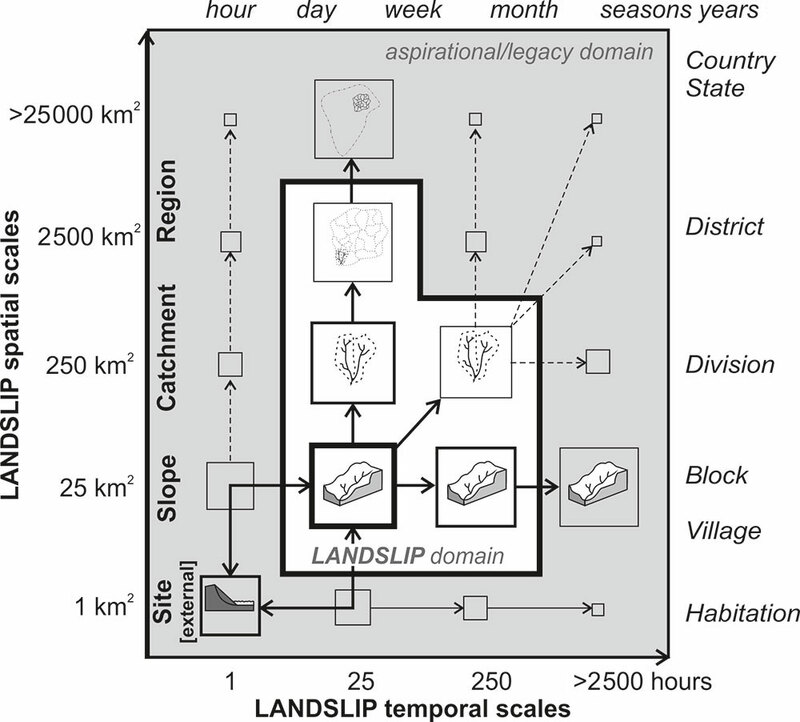 Due to complex environmental conditions and triggering processes that cause landslides, the extent and variability of spatial and temporal scales mean that landslides are inherently difficult to forecast and manage at site, slope, catchment and regional spatial scales, and hourly to decadal temporal scales. LANDSLIP will address this by doing research to understand the weather regimes (previously not done in South Asia) and rainfall characteristics that trigger landslides and geomorphological/geological control factors that can enhance landslide susceptibility. Knowledge of where and when historic landslides have occurred and under what environmental conditions will also be collated and analysed, drawing on extensive consortium experience of developing and managing landslide inventories and impact libraries. An innovative challenge we address in LANDSLIP is how slope and site-specific EWSs inform wider catchment to national landslide EWSs, and how early warning information from medium-range forecasts supplements and enhances short-term (day to a week) forecasting approaches. A further aspect of LANDSLIP is improving EWS effectiveness through integrating social-dynamic information gathered from both 'human' (i.e. social media) and 'physical' sensors (remote sensing and pre-existing, site-specific wireless networks deployed by AMRITA). LANDSLIP will develop ways of utilising these sources of information to supplement existing inventories and enhance EWS information for decision makers. Tools and services, focused on a web map interface, will be developed in conjunction with local scientists, decision makers and national and district authorities to improve resilience to hydrologically controlled landslides in India, specifically using two pilot-study areas: Darjeeling-East Sikkim in the Himalaya and Nilgiris in the Western Ghats. We will ensure knowledge transfer to other vulnerable national and district authorities by assessing how they can be applied remotely in Afghanistan.